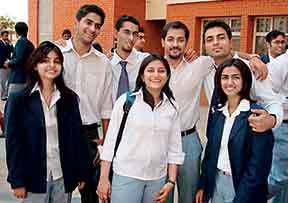 When I was in school in New Delhi, we all looked the same. You could tell standing at the bus stop which great institution we belonged to. No, it wasn’t the look on our faces or anything specific we did. It was simply what we wore – our school uniforms. The Bluebellians were blue, the DPSites were green, the Carmelites were red and so on. All those in the same school were replicas of each other through the week barring Saturdays when we looked slightly different; but even on those relaxed Saturdays we were still in our uniforms, just that they were divided into ‘house’ uniforms so we wore colorful t-shirts. Yet the uniform did what it was meant to do – unite us as students of one school or institution. Students who not only wore the same uniform but ate lunch at the same canteen, stood for assembly on the same ground together and played the same sports. It united us in front of other schools too. It first differentiated us from other school students and then united us as part of one school. Be it basketball matches or inter-school debates, the uniform including the nicely polished shoes (or hush puppies as they are called now) and a blazer to go with it were a symbol of where we came from or rather where we belonged. This was when I was a kid. And for me uniforms were an important symbol that connected me to my school. Today, as a teacher and educationist, I look at the same uniforms in a different way – sociologically, culturally, historically, and symbolically. What does a uniform really mean nowadays? Do we really need uniforms? Can children not wear what they are most comfortable in and come to school? There are different points of view on this and each more compelling than the other but still each being context-based. I recently visited an alternative school in Bangalore and children in this school don’t wear uniforms but their “home clothes”. This particular school is a staunch believer of Right to Education (RtE) Act and hence has included children from both the affluent as well as lower socio-economic backgrounds under the 25% inclusion as stated under RtE. I could never imagine a school like this not having a uniform. Isn’t it the uniform that makes all children in a school seem equal? Instead, this alternative school has left the space open for the students to decide. On being asked why they don’t have a uniform for all students, their founder explained a simple philosophy – “All children are different. They look at different things differently. They think and act in various ways. Each child has his own creativity and ways of expressing it. When they don’t behave uniformly, how can we have them dressed in uniforms, all of them looking like replicas of each other?” Until I heard this point of view, I had a completely different take on uniforms. I taught in a municipal school in Mumbai for two years. 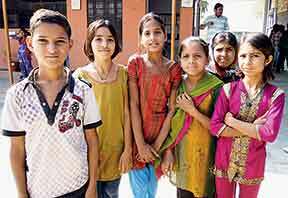 This school was situated in the downtrodden, socially, and economically backward area in Malad (Western Mumbai). 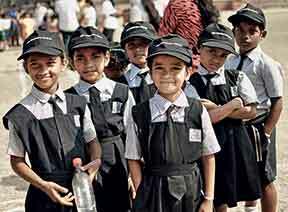 Like all government schools, children in this school too were given free uniforms under the Sarva Shiksha Abhiyan (SSA). The concept promoted by the SSA was based on an assumption – clothing is a basic need, fulfilling that will bring children to the school, increase enrolments and decrease the numbers of ‘out of school’ children. I believe in this assumption. For a parent who can’t afford two square meals for their kids, buying a uniform is completely out of question. If nothing else, providing uniforms was at least clothing the children. I remember when I showed pictures of these students to my father, his instant reaction was, “These kids look like any other private school children in their uniforms.” I was a little surprised at his reaction, but on reflecting I realized that it is true that the uniform was not just a piece of cloth for these children but also a symbol of hope and progress. So uniforms hold a social meaning and a symbolic one as well, but does it have a cultural connotation too? Yes. If you are a person like me who matches clothes and accessories and then wears them and ensures that you are appropriately dressed for every occasion, then you, like me, are also victims of cultural transmission that is brought on by uniforms. My thinking is based on the fact that some of us have been learned the culture of being dressed appropriately from our schools, which are transformation machines. Maybe I could’ve learnt this from my parents but I would still give a major part of the credit to our schooling system. If it wasn’t for my schooling, maybe I wouldn’t have been conditioned to wear matching clothes, shoes, socks, etc. Take a look at the institutions such as the army, the navy, the air-force, the police-force, lawyers, doctors, and many others. They all have uniforms. The colours and designs might have changed over the years but it is their uniform that shows that they are part of a larger institution and ‘earning’ that uniform is similar to getting a degree or qualification. Even soldiers in earlier times had colour-coded or metal-based uniforms no matter which country they came from. Maybe it is the same thought that we are still following today and the reason that a uniform is worn has not really changed over the years. It differentiated and united soldiers then and does the same to school students today. When I started writing this piece, I never thought that something as mundane as a uniform will have so many nuances to it (read cultural, sociological, symbolic, historical, economical) and could hold so much importance in our lives. Before I conclude, I’d like to share the best explanation I’ve ever heard about the purpose of uniforms. Remember the movie 3 Idiots? If you do, then you might also remember the character Ranchoddas Chanchad saying, “School jaane ke liye fees nahi sirf uniform lagti hai, uniform” (To go to school all one needs is the uniform and not fees). Maybe he’s right. After all, it is the uniform that becomes part of or rather holds together your identity while at school and at times even beyond school.